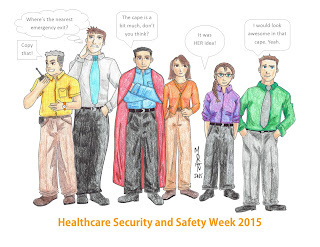 At the request of some of my readership, this is a quick "making of" blog post regarding the Healthcare Security and Safety Week cartoon posted October 11, 2015 on this blog. 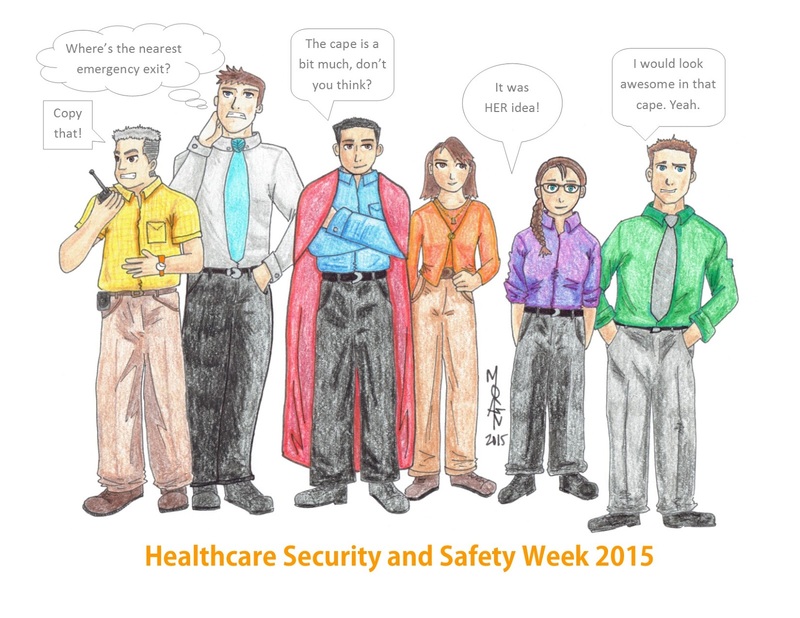 First I started with the idea: "Ooh, I want to make a cartoon of my team members to recognize their awesomeness during Healthcare Security and Safety Week." The idea happened for two reasons: 1) It's been a couple months since I last drew anything and 2) The cartoons usually make my team chuckle. Plus, a cartoon of yourself is better than a water bottle or other random IAHSS merchandise, right? After I decided a few weeks in advance that I'd like to reserve a Saturday to work on the cartoon, I attempted to find time to make the cartoon over several weekends, but to no avail. It turns out that holding three jobs (full-time safety officer, part-time professor, and occasional consultant) makes it difficult to also have hobbies. That brings us to this past weekend, where I dutifully ignored the pile of laundry, dishes, and student assignments needing to be graded. Since I knew I would only have a few hours in which to complete the cartoon, I started my research by finding a page from Hiromu Arakawa's Fullmetal Alchemist manga that fit the style I needed for the cartoon. This is lazy art, yes, but it's part of improving my art skills. I happened upon this gem in the 10th volume of Fullmetal Alchemist, the first one I picked out of my bookcase, and the second page I flipped to. It was meant to be! 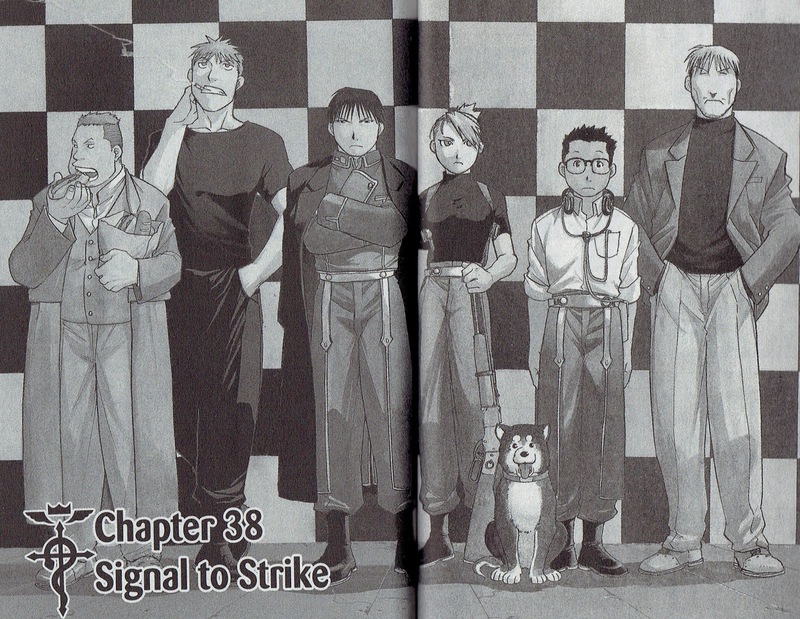 Scan of title page for Chapter 38: "Signal to Strike" from Fullmetal Alchemist. This had the number of people I needed (sans Black Hayate, the dog), and most of the heights I needed. I quickly sketched out a pencil version to see if the design would work for the healthcare security and safety team I was trying to represent. Quick pencil sketch/draft of Healthcare Security and Safety Week cartoon based on Fullmetal Alchemist. Obvious changes - the sandwich became a radio, one of the characters was shrunk down to a more accurate size, and clothing was modified to be what the team members usually wear. I kept the cape for our Director - it added a nice bit of flair and a conversation piece for the characters. The I started to ink out the characters and color with colored pencils. I'm still pretty low tech with my art, so manga pens and colored pencils are what I work with. Fully inked and half-colored, with proposed captions above the characters. I hate drawing hands and shoes. 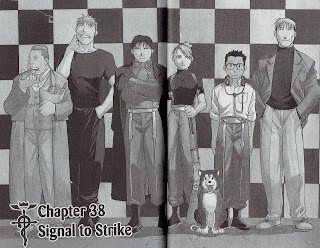 So most of them are hiding their hands (as per the Fullmetal Alchemist source material) and everyone has the same shoes. If they ask, I'm thinking my answer will be that we're all wearing safety shoes. This is also my first time drawing the Industrious Hygienist (me) as a regular person rather than the "hero" in blue and yellow coveralls like in my other manga. I'm the one with glasses, and I usually dress for work in pants and a button up shirt with cardigan sweater. The fully inked and colored version is below. Fully inked and colored, captions removed so they could be done on the computer. I sent the picture above to a fellow team member, requesting a review for accuracy. She (the one wearing orange) mentioned that the dude holding the radio is usually wearing an orange watch band rather than black as pictured. So after scanning in the picture, I made some minor edits in Paint (again, I'm pretty low tech with my art) and changed his watch band to be an orange color. I added the thought/talk bubbles and title using MS Publisher and saved the file as a PDF and JPG. The final, finished version is below. We'll see what they think of their cartoon selves. Happy Healthcare Security and Safety Week from the Industrious Hygienist!